In my previous articles we started with the different items we need to consider before we start building our model such as the Manufacturing, Features, Assemblies and Drawings. For the second article we explored the first few features of our part file and for this article we will look at the last features needed to complete our model. To start we need to look at what is left to complete we need angle cuts on both sides of our model, to create a thin wall feature for the model and to add ribs to inside of the model. The order that these items are created an how they are created is the key to success for a well built part. The first feature I think it is best to add is to create the thin walls of the part and this can be done in one of two ways the first is a Cut Extrude and the other is a Shell. 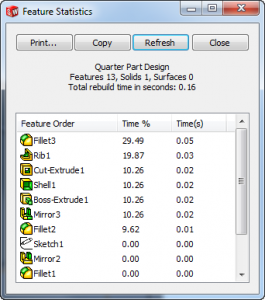 If we go with a Cut Extrude there are several downfalls to this mostly because there are several features involved with the process and any of them can easily fail with changes to other features of the model. To create this we need to create a sketch and use tools like Offset Entities. 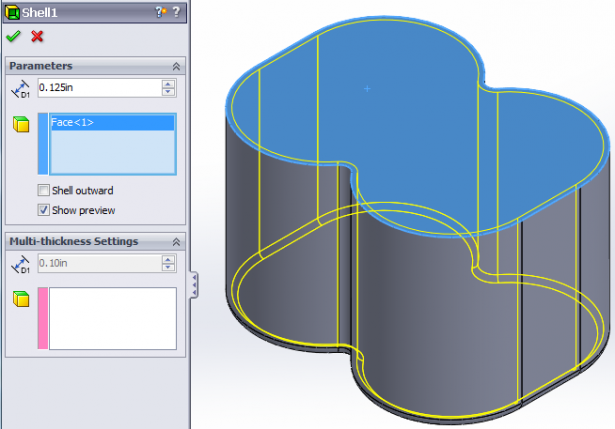 Also when you create the Cut Extrude feature you need to use Offset from Surface to create the bottom thickness of the part, but if there are items like Fillets on the part already then there is potential for undesirable results. 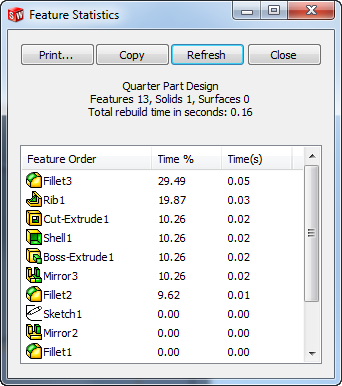 On the other hand a Shell feature does all of the items listed for the Cut Extrude without all of the work. For a Shell we input a Wall Thickness (similar to Offset Entities) and if we want walls of different thicknesses you can set that in the Property Manager. The only other item we need for a Shell is to select the Faces to Remove or you can look at it as the faces you want to be open when the feature is complete. 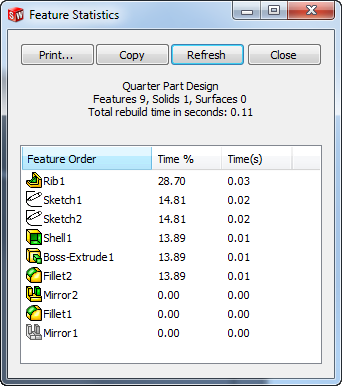 You can see from the screen shot below how easy the Shell tool is to use. There are two features left to create on our model and those are the ribs and the angle cuts to the outside of our model and I am going to start with the ribs. The reason for starting with the ribs is because we can create everything we need on the top surface and then remove the material at the end of our model creation. For creating our ribs in the model much like the Shell created earlier there are many ways we can create the feature but there are two main ways to build this the hard way and the easy way. 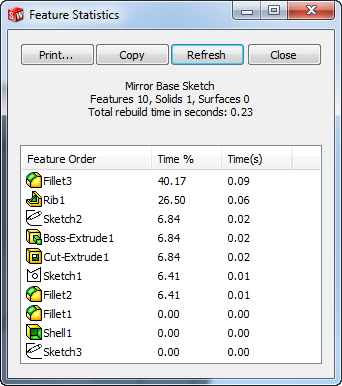 For the hard way we can create a sketch on the top face of our part and draw out all of our ribs making sure all of the line extend to the correct place on the model to add the width to the rib we can either use Offset Entities in our sketch or we can extrude out the feature as a Thin Extrude. All of this will work fine but we have to think about future changes to the model and how many relations and sketch entities are relying on other geometry and any change to those can effect weather the ribs rebuild properly. Also if you are extruding up to the bottom surface and it has Fillets like our part has you have to worry about your Extrude feature going beyond the wall of the part. The other and easier option is to use the SolidWorks Rib tool this is an applied feature and requires just basic sketch in which the line do not need to extend to the outside of the part so there are fewer relations needed and thus less problems that can occur with future changes to the model. 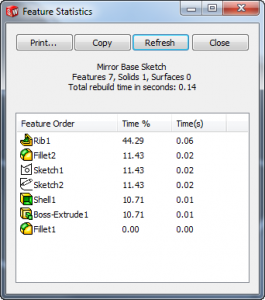 The Rib tool also allows us to specify a direction, material thickness and even apply a draft to our Ribs, you can see from our screen shot below how easy this is to use. Also in comparing our 1/2 to our whole model we are starting to see a saving in overall rebuild time as our Rib on the Full part takes twice as long to rebuild. The other advantage of creating a Half model is the benefit of only have to create 1/2 of the sketch entities and relations so there is less that can potentially go wrong with changes in the future. To Finish out our part we need just a simple sketch with an Extrude Cut set for Through All in both directions. For our 1/2 part we need an additional Mirror Feature, I chose to Mirror Bodies vs. 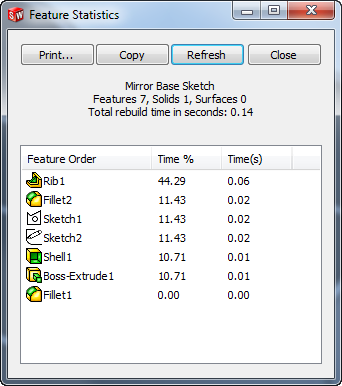 Features because the Feature based mirror takes longer to rebuild and there are more items to select. Simple is better as there are fewer relations and it makes it easier for future changes to the design. 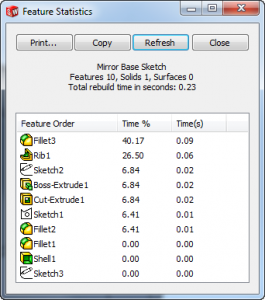 Create dimensions as you want to see on your drawing. Use construction geometry and set up your dimension and relations so that future changes do not have an adverse effect on the rest of the model. Consider your design intent before creating any features. Use the best tool for the job in our example we looked at the downfalls of using the wrong features and the effect on the performance of the model. When creating a model with symmetry starting with 1/4 or 1/2 of the model allows us to Mirror the Body vs. mirroring Features. The last items to remember is to keep an open mind and do not be fearful to try the different options and features available to you in SolidWorks. As always when in doubt it is best to reach out to you fellow engineers or you local SolidWorks reseller to get a 2nd opinion. I hope this series help everyone thanks for reading and I have attached the finished models for your reference as well as the links to the other two articles in this series.